Last summer I drove Cheddar the Chariot (my scooter) back and forth along Highway 6 on a regular basis. As any historian of agriculture is wont to do, I’d often converse with things, like the cows at the farm with the big green barn near Morriston. During one of these instances I refocused ahead to a sea of brake lights. There wasn’t any significant danger, but the traffic on my my right slowed to a crawl and I swerved around the mess and went on my way. An accident was averted but I swore up a storm and in all the commotion the only other thing that registered was yellow, lots of it, on my right. When I got home I checked on the garden and my neighbour asked if I’d seen the story in The Spectator about the sunflowers. Which? The sunflowers: thirty hectares of them along Highway 6 in Flamborough that were wreaking traffic havoc. It turns out Bogle Seeds is the largest sunflower grower in the province and they rotate the gorgeous floral beasts so that they only appear at the side of the road once every four years. The newspaper ran a story reminding motorists not to forget how to drive for the couple weeks they would be in bloom. It was like a canola field for giants. For days afterward I indulged in brief, nervous glimpses. But I never stopped, in part because I surely would have died trying to pull over, but also because by that time we had some towering sunflowers of our own, sturdy ones. Small sunflowers sometimes have those fuzzy stems, but these prickled and stung like hay slivers. 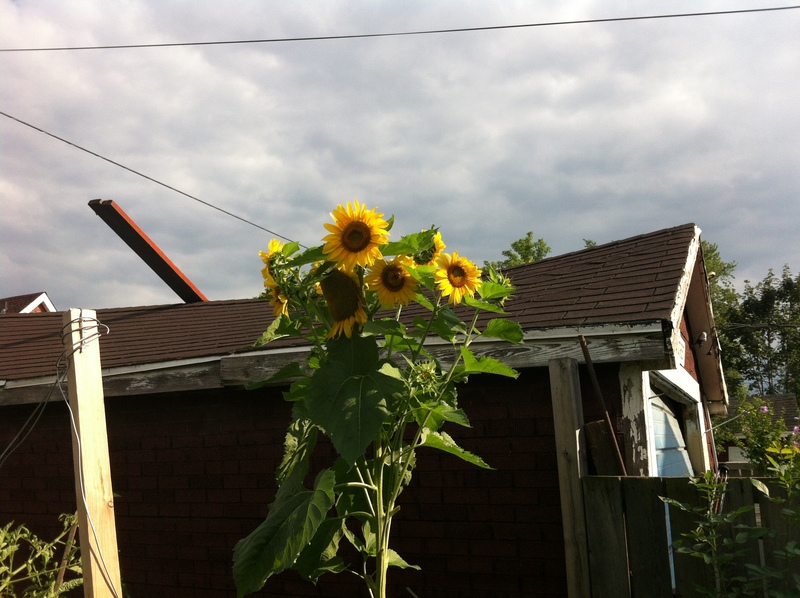 Unlike the rows in Flamborough, there was nothing orderly about our sunflowers. In fact, they were a surprise after a failed attempt to grow some the year before. Three emerged at the end of the bean patch and supported themselves on the rusty back fence. But most of all I loved the one pictured above. We didn’t have the heart to uproot it, so it pushed its way through the bell peppers and shone like a beacon for all things insistent, resilient, and haphazard. The birds descended on them as soon as seeds started to form and only a few days later they were pecked over, their faces toward the ground. We cut a few in their prime for gifts and vases but we let the stalks collapse through the fall. Perhaps they’ll surprise us again.